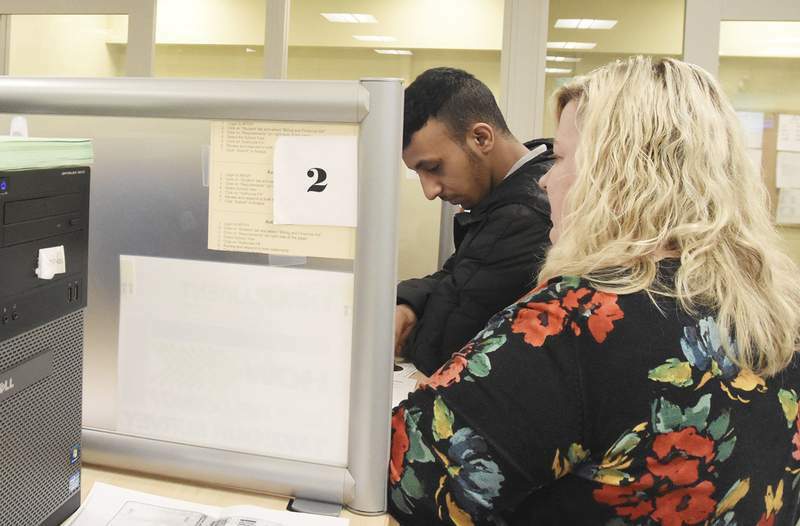 Rachel Von | The Journal Gazette First-time Ivy Tech student Musharri Albuqami, a cyber security major, gets help Friday filling out forms from registrar employee Amy Johnston during Ivy Tech's Express Enrollment Day in the Student Life Center. Rachel Von | The Journal Gazette Students enroll during Ivy Tech's Express Enrollment Day in the Student Life Center on Friday January 4, 2018. Rachel Von | The Journal Gazette First time Ivy Tech student Musharri Albuqami, Cyber Security major, left, gets help filling out forms from Registrar employee Amy Johnston during Ivy Tech's Express Enrollment Day in the Student Life Center on Friday January 4, 2018. The new students college campuses will welcome this spring semester likely are adults resuming their studies after a break, transfers from other institutions or those from other countries. Purdue University Fort Wayne, however, is noticing a growing demographic among spring semester's new students: recent high school graduates. This group comprises students who graduated in the spring but delayed enrolling as well as those who earned their diplomas in December, said Carl Drummond, vice chancellor for academic affairs and enrollment management. He noted the latter population, in particular, has increased in recent years. Spring semester begins as early as Monday for some colleges in the region, including Purdue Fort Wayne. “Probably for most universities in northeast Indiana, the number of new students coming in spring term is significantly less than in the fall,” Drummond said. 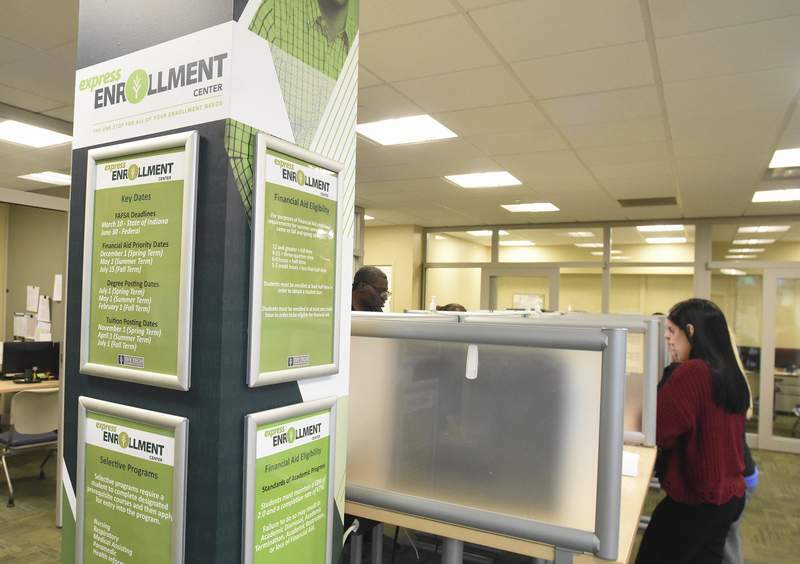 At Ivy Tech Community College Fort Wayne, recent years show new student enrollment accounts for about 20 percent of the total spring headcount of, on average, about 5,900 students, said Susan Brown, vice chancellor of enrollment services. She noted the total excludes dual-credit and apprentice students. That 20 percent is evenly spread over three types of students, she said: transfer students, traditional freshmen who didn't enroll in the fall and returning students whose studies were interrupted by life circumstances, such as a job or family. Purdue Fort Wayne, which had more than 200 new students attend spring semester orientation Friday morning, expects to welcome about 300 new students for the semester. Of those, Drummond said, about 100 are direct from high school, which includes early graduates. Starting college in the spring lets early graduates complete their first semester before the fall and, depending on credits they earned in high school and whether they take advantage of summer classes, it could result in them entering the next academic year with a year of college credits finished, Drummond said. Mid-year high school graduates are uncommon in Allen County, according to spokespeople for multiple districts. While Northwest Allen County Schools reported graduating 30 students in December, East Allen County and Fort Wayne Community schools characterized the number of their winter graduates as a few. Instead of rushing into the next educational step, she said, the district believes students benefit from staying in the supportive high school environment, where it's possible to earn college credit through such programs as dual-credit courses. “We try to keep them in high school as long as we can to continue to offer that support,” Stockman said. The district understands some students will be determined to graduate early. She noted winter graduates might also include fifth-year seniors. Purdue Fort Wayne isn't overlooking high school students who may graduate off-cycle. With more winter high school graduates seeking spring college classes, university officials are considering how they can better communicate with that population, such as building connections with area school districts, Drummond said. At Indiana Tech, welcoming transfer and international students is common in the spring, said Robert Confer, director of admissions for traditional enrollment at Indiana Tech. But, he added, the university has seen more early high school graduates throughout the years. Winter high school graduates might encounter obstacles to a spring college start if they don't plan ahead, Confer said, noting financial aid matters are a common oversight. He recommends those students file the Free Application for Federal Student Aid during their junior year. Students beginning college mid-year should be prepared for potential disadvantages, at least socially, officials said. Most of their classmates will have been together for a semester, said Rodney Maley, director of institutional research at the University of Saint Francis. “Perhaps they are starting a bit out of sync with the main group of students,” he said. At Purdue Fort Wayne, the new student orientation for spring semester doesn't have all the hoopla of the fall. “Certainly the fun and games of that first week of school when it's nice and warm in August, we don't replicate that,” Drummond said.